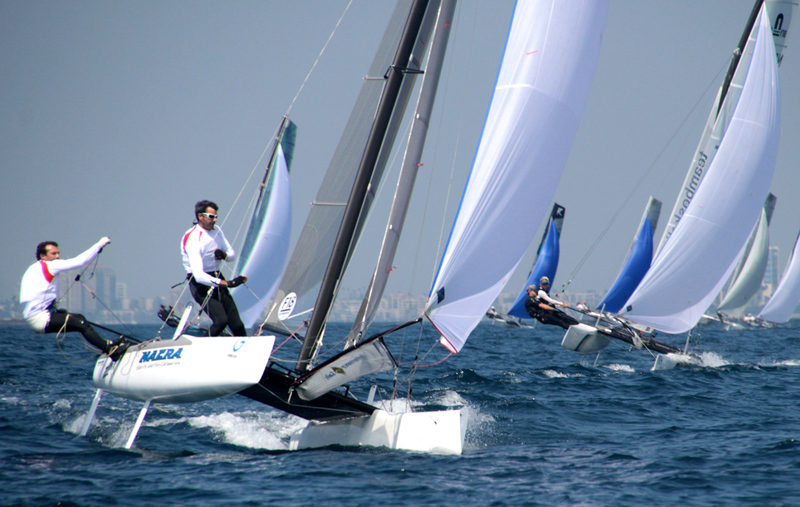 The second day's results in the GLOBALTECH Formula 18 World Championship had just been posted when Billy Besson was told that his Swiss team was in first place among the 118 boats from 13 countries he smiled, "Cool". Nearby at the host Alamitos Bay Yacht Club, Matthew Whitehead, 19, crew for Taylor Reiss, 17, learned that their boat from Florida was in seventh place overall, the highest ranking American boat, after six of 15 races. "Cool," Whitehead responded, his eyes as wide as a multihull. 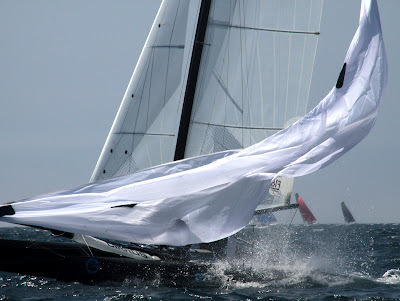 By the third and final race of the day, the wind had built to 13 knots from the southwest with gusts to 15 with the catamarans skimming through whitecaps like a field of wildflowers in classic Long Beach conditions. But it was not so cool for John Bauldry of Michigan. 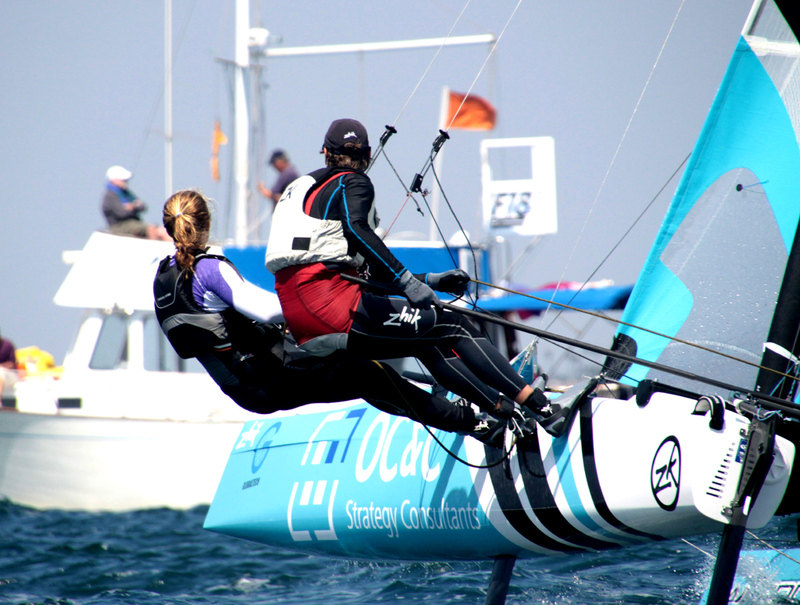 His boat, Hot Pink, was wrecked in a spectacular pitchpole and crash with rival Steve Rosenberg, whose young crew, son Jacob was being checked for trauma to his nose and the back of his head. Then there was Kelly Thompson, crew for Canada's Benoit Sonrel, who left the race course for urgent care in mid-afternoon with a possible dislocated kneecap. That's when Bauldry's boat, with the Rosenbergs on his tail, flipped forward and pitchpoled upside down, directly in front of the Rosenbergs who couldn't avoid a violent collision. Meanwhile, contrary to previous interpretations of the Notice of Race, the qualifying phase is finished after six races, not nine. 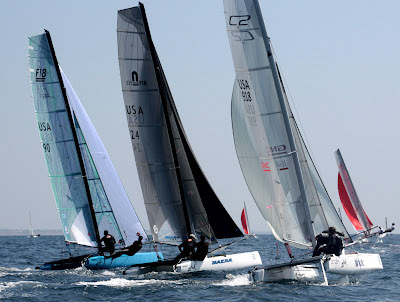 The fleet will now be divided evenly into Gold and Silver groups for the last three days through Saturday in the first F18 Worlds ever contested in the USA. The schedule still calls for three races each day, starting at noon, conditions permitting. The first of two throwouts kicked in with Race 6 on Wednesday. The second will be after 11 races, with as many as 15 in total on the open ocean course off Seal Beach. "Long Beach is perfect for racing," Besson said. "We like everything. When you're first you want to stay in first." On the other hand, Reiss said, "We were trying to be as conservative as we could by staying in the middle[as much as is possible on the trapezoid course. Primarily, this is windier than where we sail in Florida." Significantly, they won the US Sailing Youth Worlds in Long Beach last summer sailing inside the breakwater. 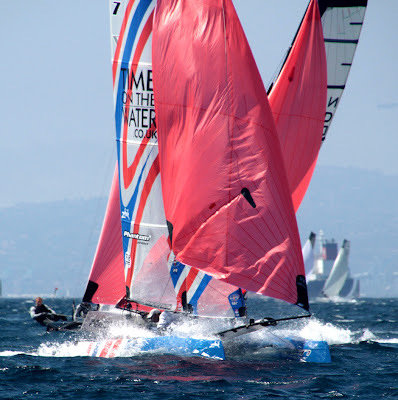 Meanwhile, Oman remains in the regatta but with a substitute skipper for Musab Al Hadi, whose right hand was severely cut in a collision early in Race 2 after he had won the first race Tuesday. Al Hadi will be replaced by Paul Wakely(GBR) and Ahmed Al Balushi will continue as crew. They'll resume racing Thursday.